His portfolio as a musician has taken him throughout the UK and abroad including Italy, Spain and the USA, and has included working as a conductor and performer with musicians such as Allen Vizzutti, John Wilbraham, Cory Band, the Childs Brothers, Jack Brymer, Max Jaffa and Don Lusher, and actors Johnny Morris, Robert Hardy CBE, Henry Goodman and Barry Farrimond. Educated at the University of York, he was subsequently awarded postgraduate scholarships to the Banff Center of Fine Arts in Canada and the Royal College of Music where he studied tuba, conducting and piano accompaniment. 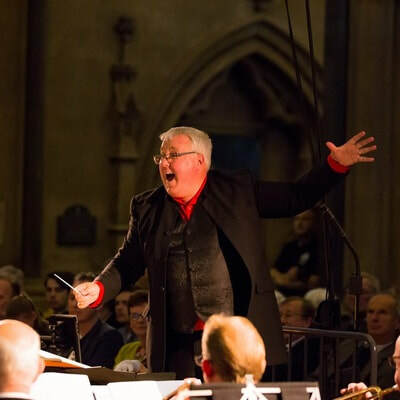 From 2008-2016, Ian was Director of the Centre for Performing Arts at the University of the West of England, where amongst his many roles, he curated and conducted numerous large-scale concerts. He enjoys a varied role as a freelance musician, often championing original music as a conductor and performer, working closely with his composer wife Dr Liz Lane, and bringing innovative musical projects to new audiences.